President Charles M. Vest welcomed the class of 2007 to the MIT community at the President’s Welcome Convocation held in Kresge Auditorium yesterday. After the “secret agent” Orientation coordinators “discovered” Vest on stage pretending to talk busily on his cell phone, he began to address the class of 2007. He first assured freshmen that they were not admitted by mistake. Vest noted that now is a momentous time to join MIT, pointing out the exciting new age of science and technology, the award-winning faculty, and most importantly, the quality of the students. Vest urged the class of 2007 to use their education to face today’s great challenges. He mentioned bioterrorism, sustainable energy, feeding the planet, and pervasive communication technologies. 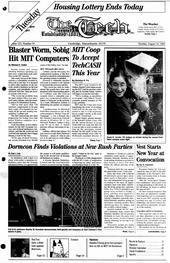 He touched on the diversity at MIT, and said that it is “one of the hallmarks,” of a fine undergraduate education. Vest spoke of the exciting energy of MIT, and described UROPs, athletics, music, and the arts, as well as other opportunities. He also talked about the evolving campus. “We were a little bit bold and ... took some risk in putting up buildings,” he said, referring to recent projects such as Simmons Hall, the Stata Center, the Zesiger Sports and Fitness Center, and the Dreyfus Chemistry building. Enthusiastic applause permeated Kresge at his conclusion. “It was kind of a long speech, but you could tell everybody was pretty attentive,” said Elizabeth Hu ’07. The keynote speaker at the convocation was Professor Edwin L. Thomas, who made a light-hearted presentation. Thomas detailed some of his experiences as the Director of the Institute for Soldier Nanotechnologies, presenting photographs of himself dressed in army camouflage while learning first-hand about carrying the heavy loads of the American soldier. Thomas’s presentation evoked some laughter; he fixed jokes into his main topic, including one subtle reference to a neighboring school. “Any speech that bashes Harvard is a good speech,” said Collin E. Johnson ’07. Before the freshmen left Kresge, both Dean for Undergraduate Education Robert Redwine and Undergraduate Association President Pius A. Uzamere ’04 gave short presentations. “You will also find that MIT is a busy place,” said Redwine, giving freshmen tips on being a student at MIT. He encouraged them to use MIT’s resources if they need help. Uzamere made a much shorter speech, for the freshmen appeared to be getting hungry for their sunny picnic lunch at Killian Court. To allow freshmen to delve more deeply into the topic of diversity and race relations, formal group discussions followed the picnic lunch. In small classrooms, orientation groups and discussion leaders exchanged views about issues such as the reality of racism in America, political correctness, and affirmative action. “I think it went very well,” said Associate Dean Ayida Mthembu of her discussion group. She said that even when people disagreed, they were able to smoothly continue discussion.